This authentically dairy-free Greek tsoureki or sweetbread was traditionally made during the winter months with autumn harvested pumpkins. 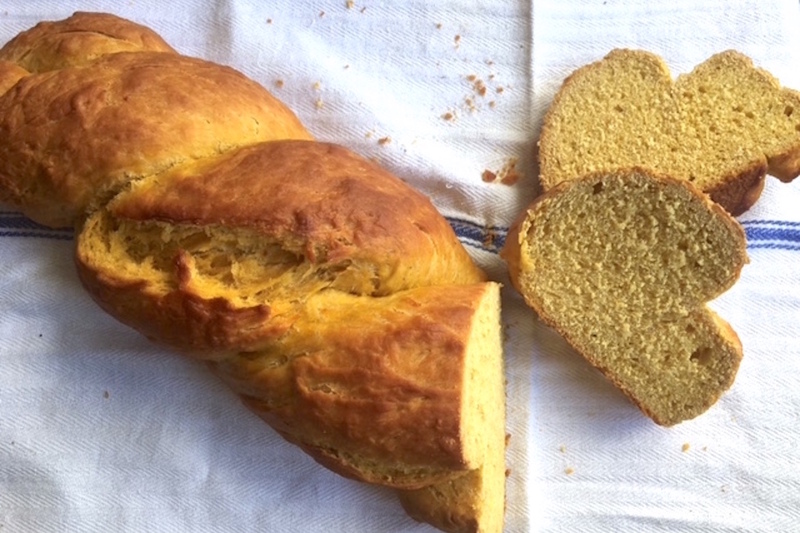 Since ingredients such as eggs and butter were less available in colder months, Greek nikokires (homemakers), created this delicious dairy-free and incredibly flavorful sweetbread we have today — pretty amazing culinary geniuses! This recipe is for all bread-baking skill levels. It’s not difficult at all and is a great way to start your homemade bread making career. 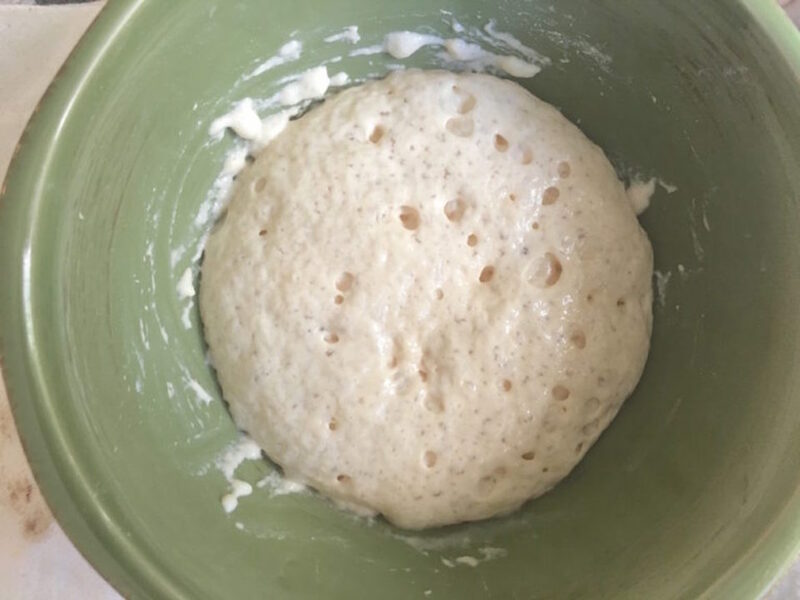 The method used to proof the yeast in this recipe yields a proofed yeast that closely resembles the more traditional wet leavener, or sourdough starter, that makes Greek breads so good. 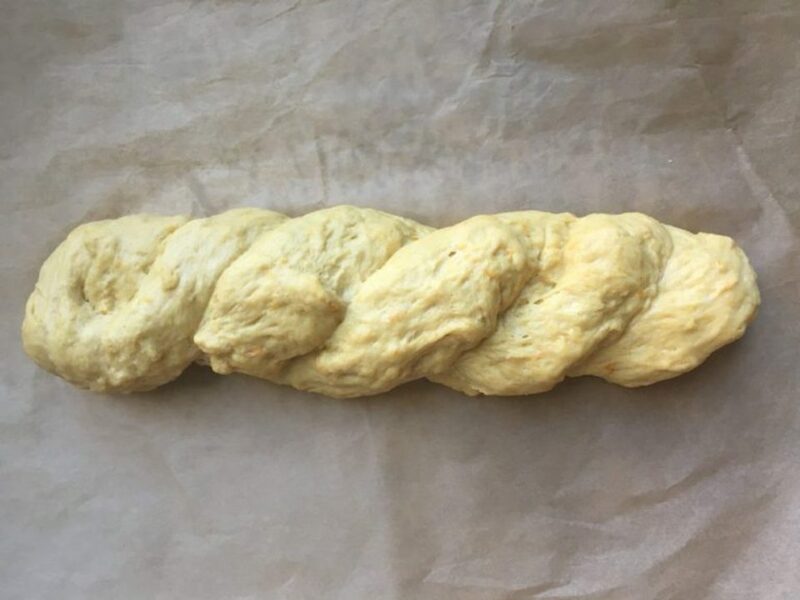 You’ll be amazed how this tsoureki rises up light and high with a moist crumb and beautiful golden color. Do follow the instructions as written even though they look a little longer than our other recipes. The details are key to moving this recipe along at a good pace —and successfully braiding the dough — with no wasted time in getting you to a warm loaf of freshly baked, delicious pumpkin sweet bread! Pumpkin tsoureki is an especially flavorful sweetbread — amazing all on its own or slathered with your favorite jam. Try it toasted with nutella/merenda and you’ll be in heaven! For this recipe, you’ll need 3 bowls – 1 cereal-sized, 1 medium and 1 large mixing bowl – 1 sheet pan and 1 clean dishtowel. This loaf will yield 10 generous slices. Kiki Vagianos is The Greek Vegan! Kiki lives and cooks in Boston. She spends her free time collecting, testing and posting favorite traditional Greek recipes at The Greek Vegan website. She loves sharing these simple and delicious authentic dishes and helping to bring them back into kitchens throughout the Greek diaspora. Kali Orexi!